A mixed acid–base disorder is defined as the coexistence of 2 or 3 primary disorders in the same patient. These disorders can occur simultaneously or at different times. Two groups of patients are at risk for mixed acid–base disturbances: the critically ill patients in the intensive care units; and the elderly. Also, diabetic or alcoholic subjects may present to the Emergency Department with a double or triple acid–base disturbance. In general, the critically ill patients have multiple medical conditions that can elicit a mixed acid–base disturbance. For example, a septic or liver failure patient can present initially with a respiratory alkalosis and subsequently develops a high anion gap (AG) metabolic acidosis due to hypotension. The other group of patients, the elderly, may have a chronic disease such as chronic obstructive pulmonary disease (COPD) with respiratory acidosis and subsequent development of metabolic alkalosis due to a thiazide or loop diuretic for treatment of cor pulmonale. 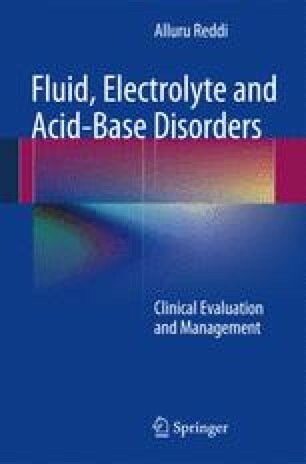 Recognition of a mixed acid–base disorder by the clinician is extremely important for appropriate care of the patient. For example, failure to recognize the metabolic alkalosis superimposed on chronic respiratory acidosis may aggravate hypoxemia because both disorders are associated with an increase in pCO2. Also, vigorous saline administration may improve the underlying metabolic alkalosis while lowering the pH to a dangerous level. To avoid these changes, it is extremely important to recognize both disorders and treat them simultaneously so that the patient’s condition would ultimately improve.